“Me no yike (sic) what are you doing” this is Metu’s current favorite expression. He just turned two. I find it quite cute when he says it but as I thought about it the other day, I realized how empowering it just be for him to be able to express a dislike and know that he will be heard and listened to. 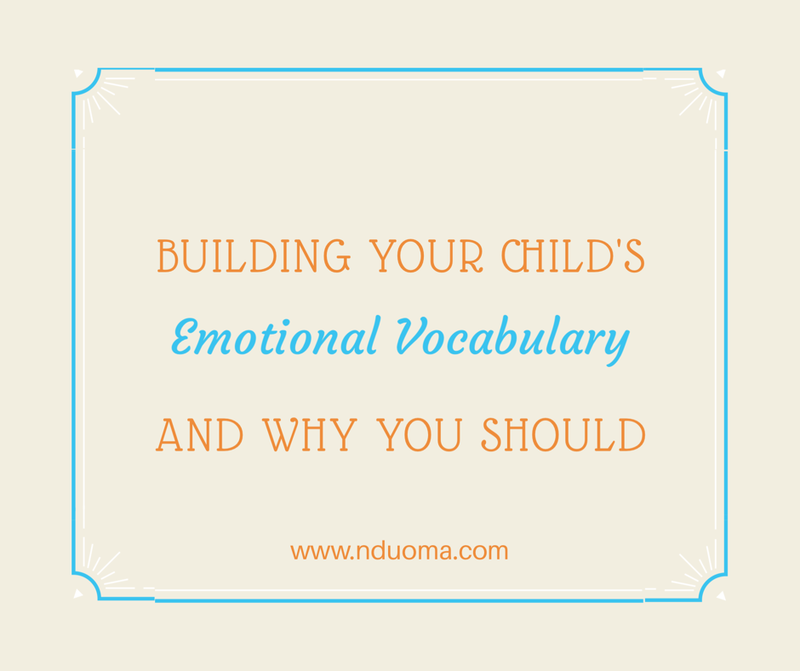 As I spend more time with children and even adults, I realize that while there is a huge focus on early literacy and vocabulary building, not enough effort is put into building the child’s emotional vocabulary. 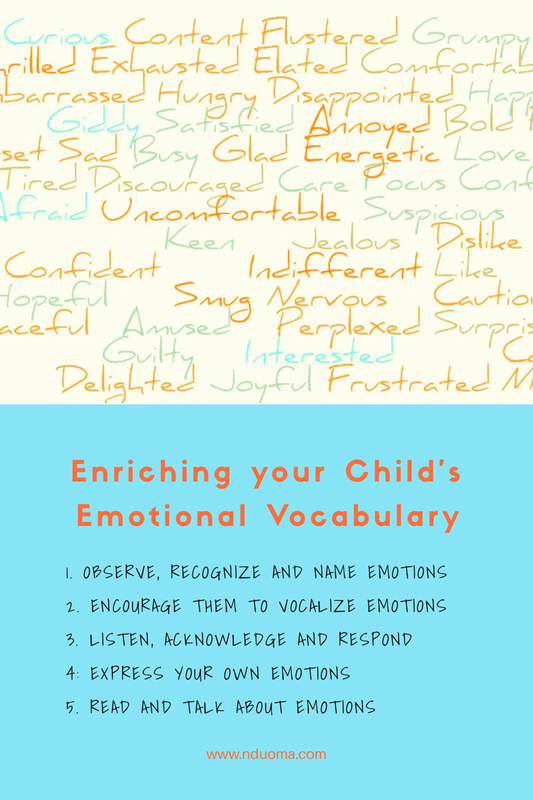 How can we help our children build a rich emotional vocabulary? Acknowledging the child’s feelings does not necessarily mean agreeing with their actions. I frequently say things like “it’s ok to be upset but we should not hit people.” Or “I know you’re upset but I can’t let you throw that. It’s not safe” And later when the child is calmer, we discuss better ways to deal with the feeling. Model to the child the whole range of feelings, make sure you model using the vocabulary as well as the right ways to express those feelings or deal with them. 5. Another way to enrich your child’s emotional vocabulary is through books. There are books that deal specifically with feelings. They show pictorial examples for each feeling and give names. Others discuss how to deal with the emotions.Even books not specifically about emotions can be used to discuss and enrich the emotional vocabulary though. When looking at illustrations or discussing a book with your child, you can ask what they think the character is feeling, what made them feel that way, how they reacted etc. we also like this emotions deck from Marie-Claire. I think they would be ideal for the 3+ crowd. Bonus : The Nigerian culture does not seem to encourage the verbal and physical expression of love. We grow up knowing our parents love us because they provide our needs etc but it is not a replacement for telling your child “I love you” as often as as possible. Reassuring them often of your love even when they are not on their best behavior is such a gift and confidence builder. It will also make a difference for when they are in incomfortable situations. It is your voice reassuring them that they will hear in their minds. Accompany your words with touch. Give your child at least one hug daily and remind them of one thing you love about them. What are some other ways that you enrich your child’s emotional vocabulary? This is a wonderful article. Thank you very very much. Is there a way I can share it that you would be happy with?